Reading this might make you want to get in a kayak or a canoe and have extreme fun with your whole family: You have been warned! I was very apprehensive about going kayaking but I like to try any new sport once. We are in Wyoming for the summer and the water here is super cold, keep in mind that I am a southern girl and any water below 70 degrees is cold to me. 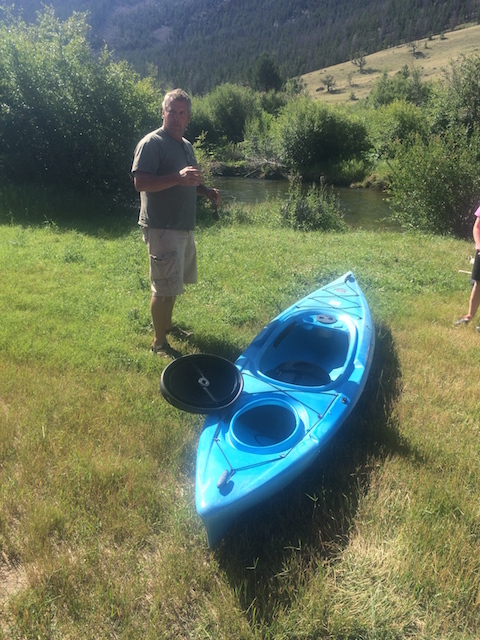 I signed up the whole family for an extreme family fun kayaking trip down the and canoe trip thinking I would be the first one in the drink, or water, so I was not looking forward to getting wet. Our guide was a local celebrity, Joe Brendal, who will be on the hit tv show “Naked and Afraid” in a couple weeks. He is the scout master of Dubois and has helped more young men become eagle scout than any other city in the US. Joe and the other Boy scout leaders actually take these young men and teaches them real life survival and camping techniques. We started our adventure with a few minutes of basic instruction on how to steer, get off rocks, get unstuck, and how what to do if you stat tipping over. We were told how easy it was to maneuver and that most of us would stay pretty dry, which made me extremely happy. 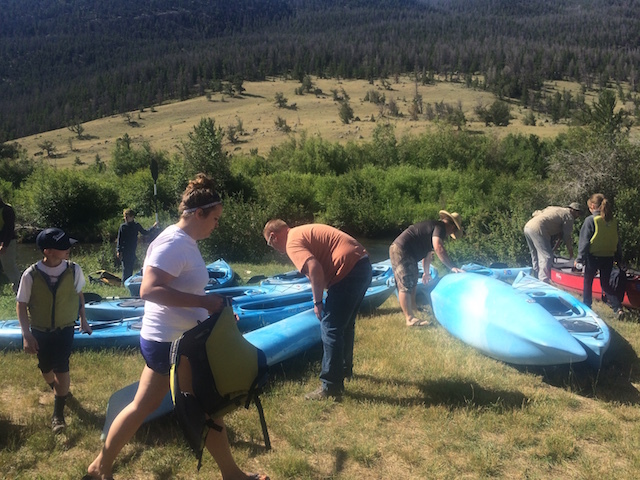 There were a total of 15 people that singed up and we all set off down the river. I almost tipped over in the first 2 minutes but luckily saved myself from getting wet because I was in very shallow water. The river flowed pretty steady, Huggs went backwards for more than half the trip down the river because she kept getting turned around. Munchy got so comfortable with the kayak she was standing by the end and having a blast. I only got stuck 3 times and had more fun ramming other kayaks, honestly I had no control and had a grin on my face the whole time. Once we made it to the lake we ate lunch and then played dodge ball. Everyone had a blast and I think I won the first round, Rubber Ducky got so competitive that he tipped his boat over twice. We got to hear stories about Joe’s adventure in Africa and all about the filming of his episode for “Naked and Afraid”. He told us how they caught food, about a hippo that tried to eat a camera and his fellow co-star. I think all 15 people gave this adventure five out of five popcorns. The cost was only $10 per person, which included a kayak and lots of extreme fun. The view was amazing but unfortunately we didn’t get to catch any fish with our hands, which Huggs was really looking forward to. We made lots of new friends and we plan on going again. 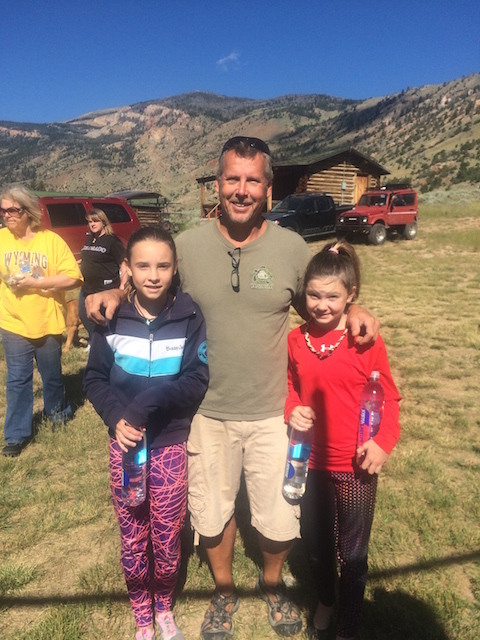 This entry was posted in PE/Health, Unschooling and tagged canoe, family fun, kayaking, PE, Wyoming by Chrissie. Bookmark the permalink. my goodness Belle has almost caught up with Mac. you go family!